Alfie May has gone on vacation with the words of his manager ringing in his ears: ‘You must do better’. The former non-league striker struggled to recapture his early season form after two months out with a hernia problem. 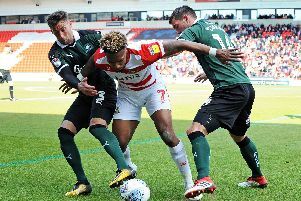 May, 24, was hauled off at half time during Rovers’ penultimate game of the campaign against AFC Wimbledon and was an unused substitute for the final day defeat to Wigan Athletic. He scored six goals in 31 appearances last season. Four of those goals came in his first five appearances. May arrived from eighth tier Hythe Town in January 2017, signing a two-and-a-half year deal - his first ever professional contract. “He needs to improve,” said Ferguson, following the 0-0 draw with Wimbledon. “And we need to find a way of trying to get that improvement in him.